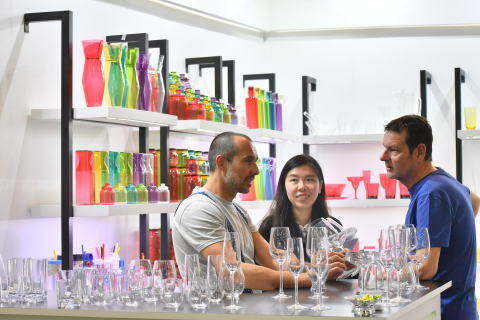 Asia’s leading HKTDC Hong Kong Houseware Fair is welcoming its 34th edition in the Hong Kong Convention and Exhibition Centre from 20-23 April 2019. Some 2,200 global exhibitors will showcase a wide range of high-quality household items to global buyers. In 2018, over 29,500 buyers from 112 countries and regions visited the fair. HKTDC is partnering with WGSN, a well-known trend forecasting agency, to curate the trend concept display areas, unveiling the Spring/Summer 2020 houseware trends with a variety of houseware and interior design products on display. In order to create an easy-to-navigate setting and provide a superior sourcing experience, the Houseware Fair will continue to feature products under four main themes that represent a harmony of “L.I.F.E”, namely “Lifestyle”, “Interior”, “Feast” and “Enrich”. Zones under “Lifestyle” includes “Hall of Elegance”, “World of Fine Dining”, “World of Fine Decor” and “Green Living”. “Interior” is comprised of the debut zone “Candles and Scents” and other zones including “Interior Decor”, “Festive Decor”, “Best of ASEAN”, and “Group Pavilions”. Exquisite decorations which are indispensable for visionary interior design can be found here. “Feast” features “Tableware”, “Wine Tools & Accessories”, “Kitchenware & Gadgets” and “Home Appliances” zones. A wide spectrum of refined cooking and dining tools will be showcased. “Enrich” is where the “World of Pet Supplies”, “Homepedia”, “Baby Products”, “Bath, Beauty & Healthcare”, “Home Cleaning & Laundry”, “Storage Solutions”, “Outdoor & Gardening”, “Furniture”, “Trade Services” and “Startup” can be found. An array of seminars, networking events, product demo and launch pad sessions will be arranged during the fair to facilitate business matching and networking. Held concurrently in the same venue, the HKTDC Hong Kong International Home Textiles and Furnishings Fair will take buyers into the blossoming world of fine textiles.